“Kate” was the first tennis coach in Tucson Public Schools, coaching girls’ tennis at Tucson High from 1934 to 1944. 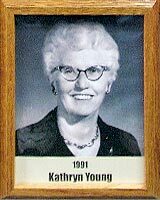 She was responsible for promoting girls’ physical education; coaching throughout Tucson and prepared many girls for city and state competition. She also coached gymnastics at Palo Verde High School (1960-68). Since athletic competition on the state level was just evolving, emphasis was on physical education and intramural programs. The physical and health education programs at Pueblo, Catalina, Rincon, Palo Verde and Sahuaro high schools were a direct result of Kate’s positive influence. Her guidance and support were also reflected in the successful records of such coaches as Mary Hines, Pauline Jordan, Betty Nye, Toni Edwards and many others. During her high school years in Ohio and Michigan (1921-25), Kate competed in every sport offered, especially field hockey and swimming. At Central Missouri State Teachers College (1925-28), she again played every sport available (in those years, opportunities for female athletes were exceedingly limited); coached freshman teams in basketball and softball; and was voted Outstanding Athlete in her senior year. She was the 1977 recipient of the Tucson Women’s Sports Association Special Recognition Award. Kate was very instrumental in developing the guidelines/rules of the Arizona Interscholastic Association and in helping make tennis the first official interscholastic sport for girls in Arizona.